Suggestions on larger scale fermentation gear? Hi, I've been fermenting for about a year now and am starting to feel fairly confident with it. 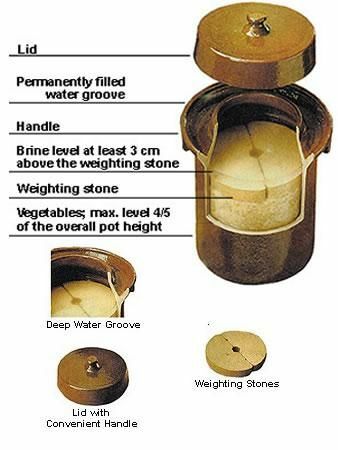 Thus far I have been using Mason jars, both the classic size and the double size ones, to good effect, with pickle pipes to release air and generally cabbage leaves to keep stuff submerged although I have recently bought some purpose made weights. However, now that I'm reasonably sure I won't ruin it, I'd like to move on to larger batches, and I've got an awful lot of peppers growing this year so ideally need to find a solution over the next few months. My first thought was the cheap but no doubt effective plastic brewing buckets used for home brewing of wine or beer. The thing that stopped me from just buying one is that I have read many times in guides to home fermentation that the acid can break down plastic resulting in unwanted stuff in the product. Does anyone have any experience with this? If you are satisfactorily using these, how do you keep the mash submerged? Obvious option #2 is glass demijohns. Still pretty cheap and removes plastic from the equation, plus gallon sized ones would actually be ideal, could get a few different combos on the go then. I guess you could just use the same fermenting bung with airlock you'd use for wine or whatever. 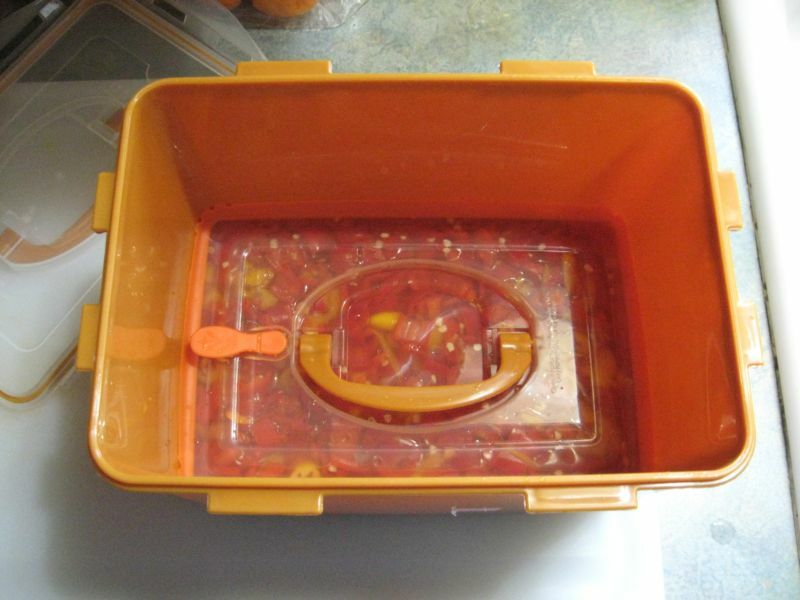 However, the thin neck seems like it would make it harder to get a weight/strainer type thing in there to keep stuff submerged - if you are using these, how do you keep the mash submerged? And of course I might be completely missing an even better solution, so if anyone has any ideas on fermentation vessels larger than mason jars I'm all ears!!! what kind of plastic? i think anything 'food grade' should be fine. i don't see any issues beyond the typical concerns about using plastic for food and drink in general (endocrine disruptor). PET should be OK -- soda is pretty acidic. HDPE is another option. Edited by nice.chili, 09 July 2018 - 12:27 PM. I love the Korean kimchi fermenters with a inner lid. Available in upto 45 liters. Available through crazykoreancooking or directly from E-Jen on Amazon. Little Big Mouth Bubbler would be a nice step up from a Mason jar and pretty reasonable cost for glass too. Lots of brew shops sell them for about $20 or less. Edited by ShowMeDaSauce, 09 July 2018 - 02:54 PM. Thanks for all the replies thus far people, loving it, so many options! I've gotta say, those Korean numbers look fantastic, they look to be very convenient with the inner lid, friendly price, and they are available in the UK which is good for me. So, I'm thinking these have moved out into pole position. I'd still be interested in glass options I think, but knowing how seriously kimchi is taken in Korea, I'm sure these must be entirely fine to use over and over again. The first two options look to have great potential! No idea about food grade polypropylene in general. Kimchi has a pH of approx. 4.2-4.5, whereas the fermented hot sauce I make has a pH of approx. 4.7 at the outset and finishing at approx 3.5. Edited by nice.chili, 09 July 2018 - 05:02 PM. You can get a Korean Onggi that is MASSIVE but it will cost you some big $$$$$. There are also similar kraut crocks. They seal with a water ringed lid. Both are not cheap. Ive fermented kimchi for many months in my E-Jen type container. I can assure you it is pucker sour after a month. Big mouth bubblers are available in glass or plastic, and 1 gallon to 11?Gallons. East to clean,. Couple option s for the airlock. Water in the lid or air bubbler. This is what I want too. Something clear so I can see what is going on inside, check for kahm yeast etc. Presently using clasp/clamp lid jars without the rubber ring to keep them from exploding. Unfortunately the brewing suppliers here is not all that responsive to inquiries partially due to the fact that home brewing is illegal <rolls eyes> to keep the booze monopolies going and charging $1.11 for a can of freakin Singha. Also, everything is imported here. There are industries here of course, but unlike the US, the markets for fermentation gear is small as they'll use any old thing or whatever has been used historically. So I decided to get one of the plastic kimchi ones, ordered it last night and amazingly it was here this morning! I'm very impressed with it actually, the inner vacuum lid is a major bonus. I went for a 3.4 litre one to see what they're like and it will easily fit in the fridge, so even if not suitable for chillies, it will get plenty of use for pickles, kraut, and perhaps even kimchi! But I do take your point nice.chili - if the ph of chillies is potentially so much lower than kimchi I wonder how this will hold up to that. Definitely interested to hear from anyone who is using food grade plastic vessels to ferment - do they hold up well, or have to be replaced frequently, etc? With regards to the ceramic ones, they look really nice actually but yeah - expensive for a good sized one. But I see that you have been using an e-jen type for kimchi ShowMeDaSauce - have you ever tried it with chillies? The Big Mouth Bubblers look totally ideal in terms of glassware, and they are available here in the UK which is great. However what do people use to keep the mash submerged? For my mason jars I've been using veg leaves or glass weights but obviously these are not going to work here. The obvious solution to me would be some sort of mesh, perhaps the sort of stuff I have in my dehydrator - but this is of course plastic so brings that issue back into the mix. I may be dead wrong here but I've never worried about chili mash staying submerged. I've considered it, given it's wide practice, but so far I've had only one instance of kahm yeast and one instance of something nasty in a very small batch that I attribute to possibly not sterilizing the bottle before adding the mash. That batch was tossed. In my use, the water all sinks to the bottom of the mash. I stir it daily during the initial highly active fermentation and then every so often once it has settled down. I would think if you have one of these, which I'm considering as well, you'd be good to go. I see that you have been using an e-jen type for kimchi ShowMeDaSauce - have you ever tried it with chillies? Some glass beads or weights in some cheese cloth works to keep the produce under the brine. 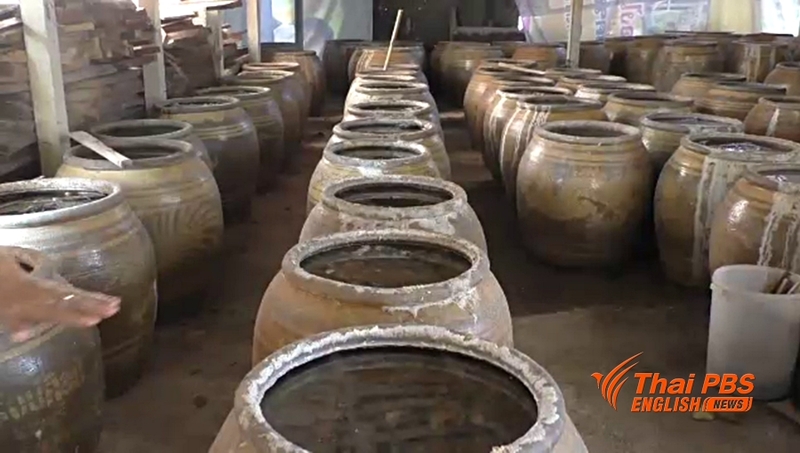 There are some pie shaped ceramic or glass pieces sold by kraut vat makers. I used the 7 gallon kegco glass carboys linked above for my hot sauce. Last year I had 11 of them total. They worked wonderfully, but I would warn you that the glass is a lot thinner than it looks. I accidentally broke a couple of them and I was kind of shocked how thin, way thinner than window glass in spots. I started with quart mason jars, then moved to gallon jars (from Uline.com) that i installed 3 piece airlocks to. 5 lbs of peppers fits in a gallon jar nicely. This year, we will be using food grade 5 gallon buckets with 16 oz air locks (tubing and water bottles). 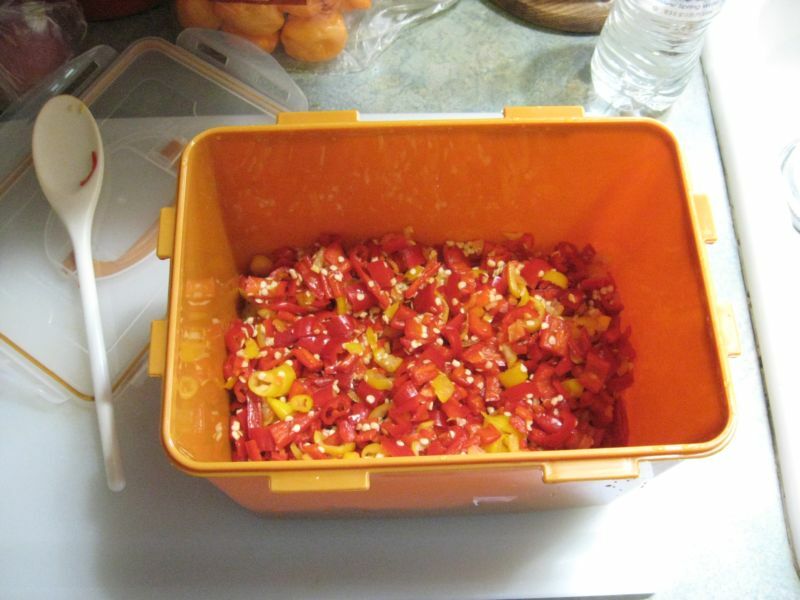 20 lbs (4 gallons) of peppers per bucket. I like the food grade buckets (5galUS) from home depot, same as the home brew buckets but 1/10 the cost, no graduations.